A few weeks ago Google announced that search results for common health-related topics will soon include relevant facts in its Knowledge Graph. In other words, key information related to many medical issues—such as certain diseases’ symptoms and treatments—will appear directly alongside site links. Given that these sorts of queries are so common—Google estimates that one in 20 searches is health-related—this shift will likely have a huge impact on how consumers engage with medical information. However, to truly gauge the effect on healthcare marketing and publishing, it’s important to understand what the search changes do, and don’t, entail. Here, then, is a brief overview of what Google announced and what the moves may mean. Q. What exactly did Google do? A. 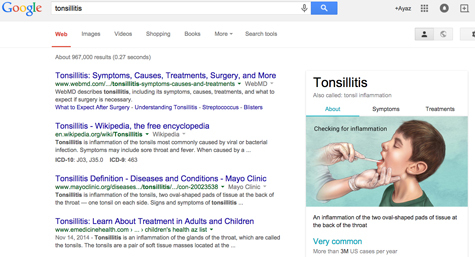 Basically, Google expanded its Knowledge Graph to specifically address health questions. Knowledge Graph, which augments standard search results with immediately available snippets of information, was introduced in 2012 and has been steadily expanding since then to address different types of queries (for example, searches about people, movies, music, etc.). While Google doesn’t intend the results to be “medical advice,” it did work with a team of doctors to curate and review the information presented, as well as with medical illustrators to provide some of the imagery. According to Search Engine Land, the augmented results currently appear only in U.S. English searches conducted via desktop and Google’s mobile app (Android and iOS). Over time, the changes are expected to be rolled out internationally, as well as to Google’s other search offerings. Q. What do these search results look like and what do they include? A. A key thing to note is that the Knowledge Graph information appears differently for desktop and mobile users. In desktop searches, the Knowledge Graph box appears to the side of the standard search results. It generally includes an image, some basic facts (how common and serious the condition is), and tabs with more information on symptoms and treatments. On mobile, the Knowledge Graph information appears as a card before the search result links. Given that the Knowledge Graph information is displayed before any other options on mobile, it’s likely that it’ll have a bigger impact on phone and tablet medical searches compared with desktop searches. Q. Why did Google make this change? A. In announcing the move, Prem Ramaswami, a Google product manager, told the story of trying to search for information on whether his son had a concussion. The search results he received didn’t help quickly answer his questions, nor were they easy to sort through. The expansion of Knowledge Graph to health queries is meant to address these problems. Google believes that people should be able to find answers to common medical questions quickly and easily. The company also believes that health information found online should be trustworthy and factual, which is why Knowledge Graph verifies and validates content. Google is not trying to replace healthcare websites. The idea is that once you get basic medical information about a condition from Google it should be easier to conduct research on the Web because you have a basic starting point of factual information. Knowledge Graph makes certain resources are immediately available via select links, and the full set of search results is still always displayed, as well. Q. What does this mean to publishers of healthcare and medical information? A. The current selection of sites that Google pulls medical information from is somewhat limited (you can see the sources here), and you can’t immediately influence what’s displayed. However, the increasing presence of the Knowledge Graph in health-related search results indicates that Google will likely seek out more publishers over time for inclusion in this coveted search real estate. 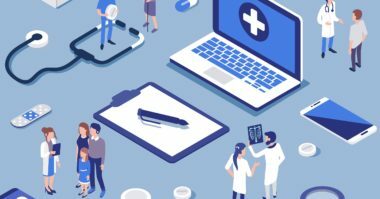 This means that healthcare marketing experts may have an opportunity to position their content front and center for medical queries and gain significant long-tail traffic. The current healthcare Knowledge Graph demonstrates what Google considers important from medical websites. Emulating what those publishers are doing right—namely providing genuinely trustworthy information—can serve as a model for success. Of course, just producing good content isn’t enough; it must also be found by Google. Therefore, it is essential for publishers to utilize schema markup to feed search engines as much information as possible about the content. 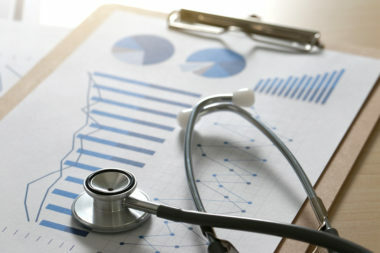 Ultimately, given the growing prominence of Knowledge Graph in Google search, providing in-depth, high-quality, easily found information should be an essential part of content development for any healthcare marketing strategy. 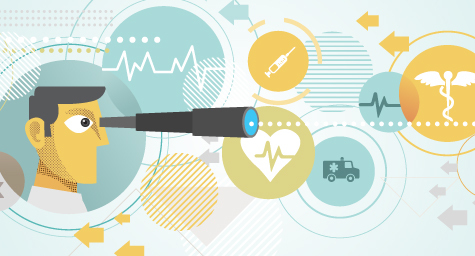 Examine the latest trends in healthcare marketing. Contact MDG Advertising today at 561-338-7797 or visit mdgadvertising.com.